Back when I was first getting my feet wet in the business of globetrotting, I traveled without any agenda whatsoever. Oh sure, I would read guidebooks and listen to advice from people on where to go, but as for what to do when I got there, I rarely had any plan other than to just ‘experience’. Normally that meant walking around aimlessly for a few days, finding some spots to people-watch, and writing up my impressions on postcards to send to people back home. I might see something famous if I could afford the entry ticket; I might eat something local if it fit into the cost parameters of my bread-and-cheese diet, but most important to me was the idea of just being there and seeing how life happened – how the ebb and flow of these places were different from the places I saw every other day of my life. My method set me apart from normal tourists, I believed, who were all so busy rushing around following the advice of their guidebooks and ‘must-see’ lists that they missed out on what was really important. I, on the other hand, lived entirely for spontaneous discoveries and chance encounters, and I reveled in being so free from obligation and expectation. It was liberating, sure. It was also kind of boring. At some point along the line, though, things changed. I got myself a traveling partner, I started having a little more money, and most important of all, my interest in food mushroomed out of control. I went from being aimless and agenda-free to being the world’s most compulsive trip-planner, only that instead of stuffing my suitcase with lists of museums and monuments, castles and cathedrals, I started filling them with lists of food. Particularly if it’s my first time visiting a place, I’ll spend weeks researching typical products, famous dishes and restaurants, markets and shops, and when I get there I’ll not let a minute go to waste in my attempt to cram it all in – both figuratively and literally. Of course I’ll often be able to squeeze in some more traditional culture as well (as long as it’s not an art museum – I’m pathologically allergic to those! ), but admittedly that often happens only if said culture happens to fall along the path I’m taking anyway to my next food destination. Our recent trip to Morocco, of course, was no exception. Thanks to some intensive internet and cookbook research, I knew everything there was to know about the dozen types of tagine, couscous and bisteeya I had to sample, the harissa, harira and charmoula, the mint tea and almond milk, the bread and pastries and dates and olives I had to track down in order to have the full Moroccan food experience. And for the ten days we were there I ate as many of them as I could find, stuffing myself like a Christmas turkey so I wouldn’t miss one not-to-be-missed morsel. Imagine how foolish I felt, then, when it was my insistence on exhaustively completing my own list that nearly caused me to miss out on the best thing of the entire trip. While I was busy ploughing my way through one tagine after another, debating the superior fluffiness of this couscous or that while trying to save room for yet another platter of rich Moroccan pastries, that little section of the menu called ‘salads’ was going completely neglected. It wasn’t until one lunchtime when, flagging under the heat of the midday sun, I felt that I simply couldn’t stomach another rich dish laden with meat and honey and fruits and nuts, and so I opted for what I thought would be a plate with a light assortment of raw vegetables – you know, lettuce, tomato, onion, and maybe some carrots and olives. I was completely floored when what I actually received was a veritable banquet in itself: a dozen small bowls, each featuring a vegetable or two, each prepared differently yet complementing the others perfectly. Some were fried, some were boiled, some were raw; some were spicy, some were sweet; some were tart and astringent, others were rich and pungent, and all were absolutely delicious. I know because I finished every last one and then asked for more. I should have guessed that Moroccans have, like so many cultures around the vast Mediterranean, a magic touch with the fruits of the earth. After all, it’s not the rich celebration dishes that tourists like me seek out that have formed the backbone of their everyday cuisine for centuries – it’s the dishes made from the abundant artichokes, tomatoes, pumpkins, zucchini, peppers, potatoes, and eggplant, nourished by moist breezes from two seas and ripened to perfection under the hot summer sun. But the similarities with other Mediterranean cuisines only extend so far, since whatever form these vegetables take – boldly spiced with ras-el-hanout or harissa, enlivened with slivers of preserved lemons or fresh herbs, even seductively sweetened with a drop of honey as in this knockout eggplant dish – the result is like everything else in this fascinating cuisine: exotic, delicious, and unmistakably Moroccan. Somewhere in this experience, I’m sure, there’s a lesson to be learned. If I had to put my finger on it, I would say that in travel – like in all things, really – a happy medium is best. Funny how it always seems to take going to both extremes before figuring that out. I love eggplant in all its forms, but this is one of the best ways I’ve ever eaten it – meltingly soft, sweet, sour and spicy-hot. You can easily make this dish with baby eggplant, widely available in Asian or Middle Eastern shops, and if you like you can leave the stems attached – handy if you want to serve them as finger food. Also, if you have a grill you can easily cook them that way instead of in skillet – I imagine a smoky-charred flavor would add to the mix nicely. Lay the slices of eggplant out on a towel or cloth and sprinkle all the cut surfaces generously with salt. Let the eggplant disgorge for about 15-20 minutes, then wipe the pieces dry with paper towels. Preheat a large, heavy skillet over medium-high heat. Brush both sides of each eggplant slice with olive oil and cook in the skillet, not overlapping the slices, until well browned on both sides. You’ll no doubt have to do this in batches. Remove the slices to a plate and set aside. In a bowl combine the honey and lemon juice with about 2/3 cup (160ml) hot water, stirring to dissolve. Heat your skillet again, adding a little more oil if there is none left. Add the garlic and ginger, stirring for about thirty seconds, then add the cumin and harissa, stirring for about another thirty seconds. Stir in the honey-lemon water and bring everything to a boil. t has been reduced to a thick glaze and the eggplant pieces are completely soft (add a bit more water if the sauce reduces before the eggplant is ready). Taste for seasoning and add salt as needed. Let cool, sprinkle with a handful of chopped cilantro/coriander, and serve at room temperature with chunks of fresh bread, preferably as part of a meze or appetizer spread. One of my favorite things about living in the Middle East are the salads, there are so many and they are always present. All those rich meat and grain dishes are delicious, but are probably eaten more by tourists than by locals. Most locals can’t afford to eat those dishes everyday, but they turn their cheaper fare (vegetables, fruits, cheap cuts of meat) into the most amazing creations. I love that this uses honey, it looks and sounds delicious! This looks wonderful to me. It is definitely something I would eat. I love eggplant in so many different preparations. There is a dessert that Italians make with eggplant and chocolate, I know it might sound strange but it is actually very good. My own globetrotting trajectory was nearly identical to yours, Melissa. I started out with no agenda and stayed in campgrounds and hostels. Then I became a research fanatic and overplanned my trips. On my latest trip (to Paris) I think I made strides towards finding a happy middle way. I left half of the meals (er, I mean trip) unplanned and open for spontaneity. Much better. I’m loving your posts on Morocco. Your descriptions and Manuel’s photos makes me want to pack a bag… tomorrow! Melissa, I am thoroughly impressed with your constitution–my body goes into a revolt the minute I change the way I eat for more than a day. It makes travelling rather difficult I must say. And speaking of your tendency for food lists when you travel, I do remember the exceptionally long list you had when you came to visit me in Paris a while ago. And I specifically remember you arriving with a nearly empty backpack and loading it up with jars of Christine Ferber jams and Valrhona chocolate etc. You were definitely a woman on a mission! Your eggplant looks great by the way, I will definitely give this recipe a try. Melissa, I just love all the wonderful aromas and flavors this dish offers. Truly spectacular! I’m a huge eggplant fan–excited about the recipe! Thanks for posting. I adore eggplant, and this has got to be the most beautiful eggplant I have ever seen.Cheers! It is so easy to get caught up in one part of a trip and miss out on great opportunities. I nearly missed out on visiting Morocco that way, but lucky for me I did take the time and took a hydrofoil from Gibraltar. The sights, sounds, and tastes of just one day has made a longer trip a goal of mine. I would definitely like to track down some of this eggplant, but until I get back I’ll settle for this outstanding looking recipe. Thanks! Omg…I love your blog! (And I don’t even cook much!). I lovd the posts on Morocco. Eggplant is one of my favourite vegetables and just looking at that picture is making my stomach grumble and brain short circuit. Melissa, it’s odd how travel styles evolve, isn’t it? My favourite way to travel now involves a little of your old style and a little of your new — I like to sit by the window of a good restaurant, eat great food, AND watch the world go by. One of the best parts of a trip we took Rome a few years ago was that, by staying for two weeks, we got to spend a couple of afternoons doing nothing but sampling espressi, reading, and lazing about in various piazzi people-watching. I loved that trip.I’m also a lover of eggplant, so I will definitely give this dish a try. There’s something about the Mediterranean way with eggplant, because the mixture of sweet and savoury in this dish reminds me vaguely of Sicilian caponata, another eggplant dish that combines those elements. I made these tonight! And they were excellent. I grilled halved small globe eggplants in a grill pan and the char went well. I probably cooked it all too long–the eggplant halves started to fall apart at the end. but yummm. This is a winner. 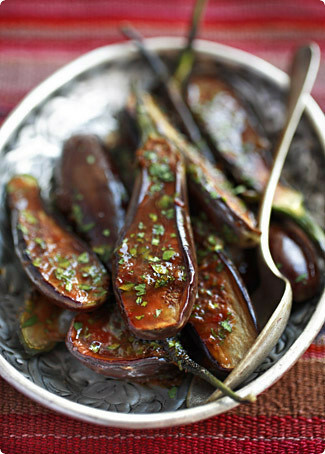 I enjoy eating eggplant any style & this Moroccan version is one I need to try! Cheers. Thanks for a delightful read, Melissa. It’s funny, before we travel, my husband and I research restaurants and markets and go prepared with an extensive list. Invariably though, it’s the impromptu meals and local gems that we stumble upon that are often the most memorable. Julie and Benjamin – Thanks for your feedback, and I’m so glad you liked the recipe! As you experienced, the first batch of these I made fell apart too. Since I intended to photograph the second batch, I pulled the eggplant out of the sauce after just a couple of minutes and let the sauce reduce separately. This certainly improved the presentation, but the flavor was far better in the disintegrating-to-mush version, which is why I left those instructions in. If I do come up with a way to make this so it looks as good as it tastes, I’ll certainly let you know (and I hope you’ll do the same)! Over the weekend I went camping with my vegetarian boyfriend and in the grocery store planning the weekend’s menu remembered having read about this dish. I couldn’t check the recipe so I tried to recreate it from memory. I didn’t remember the lemon, or the ginger and I used MUCH more honey (about a half cup, and about a cup of water). I also used red pepper flakes instead of cayenne, but in the end it still came out deliciously. It reminded us of a thai eggplant dish that we had had at a restaurant here in NYC. Thanks for the inspiration! We love your blog. We love food and unfortunately for us it´s really terrible here in Argentina. Melissa, This is indeed such a different style of cooking eggplant. I bet they taste so very good. I can imagine the honey & other spices on the eggplant. Thanks for the recipes. I am surely going to try it. My mom and I have run out of money and we had a few Chinese eggplants in the fridge. We borrowed cumin from our Egyptian neighbor and created a really good dinner. We even had some wine to go along. Thanks for this recipe. Wow, I made this recipe last night, almost to a t (i used a quarter cup of honey instead of five tablespoons, i am more of a hot than sweet kind of gal) and it was one of the best vegetarian dishes I have ever made. I ate it for dinner with nothing but a small piece of bread, and was completely satisfied. Thanks so much for a wonderful recipe, one I will be making for many years to come…seriously, BEST EGGPLANT RECIPE EVER! wow! what a burst of flavors!! !